Book Review: “Luther on the Christian Life” by Carl Trueman | J.W. Wartick -"Always Have a Reason"
Carl Trueman’s Luther on the Christian Life is a very entertaining work highlighting Luther’s view of how we should live as sinner/saints. Understanding Luther, argues Trueman, means at least in part to understand his own life and the pressures that exerted on his thought. Thus, in the first chapter (and throughout), readers get a picture of what Luther’s own Christian life was like and how that impacted his thought. Then, Trueman traces Luther’s theology of Christian life through various themes including theology of the Word, Sacraments, righteousness, government, family, and more. The insights into Luther’s life and theology abound throughout the book, and the way that Trueman skillfully weave the two together is impressive. This is a highly readable and, yes, entertaining book. There is much to learn, but it is a joy to read. Luther’s doctrine of the Christian life is intertwined not only with his own life, but also with his sacramental theology. Trueman draws this out in extended fashion, showing how these ideas are related to readers who may not be familiar with such a way of thinking about the world. 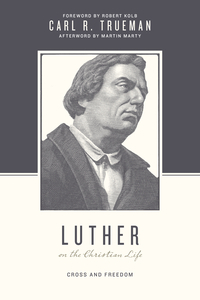 Trueman puts forward a tremendous effort to be sympathetic in his reading of Luther. The sacramental theology of Luther is put forward as part of his understanding of the Christian life without any efforts to undermine or thwart the power of that same message. Trueman is Presbyterian (or so I gather from his Introduction), and admits to serious disagreements with Luther on sacraments and other areas. But he presents in this book Luther’s view, not his own critique, and he does so generously with a spirit of trying to understand and convey Luther’s meaning. This is exactly the kind of Christ-like attitude towards those with whom we disagree that we should all have as Christians, and as a Lutheran I was taken aback by how well Trueman accomplished it. Luther on the Christian Life presents readers with exactly what they should expect: an exposition of Luther’s thought (and life) on how we should live as sinners and saints. But he goes beyond the merely expected to make this an incredibly readable, insightful, and entertaining work as well. Luther on the Christian Life is an extremely readable and insightful work that is well-worth the time put into reading, marking, and inwardly digesting it. Luther’s prowess as a theologian concerned with the lives of Christians–not just their beliefs–comes to the forefront. It is a phenomenal work. I received a review copy of the book from Crossway. I was not required to give any kind of review whatsoever. My thanks to the publisher for the book. Carl Trueman, Luther on the Christian Life (Wheaton, IL: Crossway, 2015).